The history of Gold Only 3 times the size of the swimming pool?! It is said that mankind had gold in hand for the first time back to 6,000 years ago. Through the ages, mankind indulges in the sparkle of gold, moving around the world in order to find gold. Before 15th century, only a little amount of gold was produced because the gold mining technology was limited. Even after The Great Britain adopted the gold standard system in 1816, still the gold production amount was only 5,000 tons. The full scale of gold mining began after gold mines were found in California in 1848 and followed by the discovery of the world largest gold vein in South Africa about 40 years later. In such history, the gross weight of gold mined is approximately 155,000 tons. This amount of gold is "about 3 times" of an official Olympic swimming pool sized 25 m × 50 m. Moreover, it is generally believed that some of the gold which ever produced had sunk in the sea and had already disappeared becoming buried treasure. Besides gold is mainly used for ornaments, bullion metals and gold coins, it also plays a key role in high-tech industries such as resources for satellites, videos and computers. However, according to the research of the World Gold Council, the current gold reserve on earth is about 76,000 tons. Moreover, most of the gold mines are located in difficult mining areas, in the near future, it is said there are no other ways than to continue recycling the stock on the ground. Japan almost does not produce platinum. 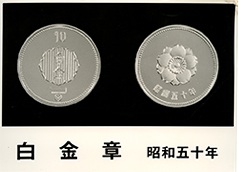 In Meiji (extended from September 1868 through July 1912) and Taisho (extended from July 1912 through December 1926) era, platinum demands had been relied on the import from the United Kingdom and the United States. However, an idea hit on Ichiro Tanaka, the second generation president to import platinum directly from the Soviet Union which occupied approximately 70% of world platinum production in those days. The negotiations began in 1920, and 3 years later in the month of April 1923 the distributorship contract was finally concluded. The contract's content was that TANAKA SHOTEN (name of the company at that time) was appointed as the Japanese sole agent of platinum and palladium, and undertook the exclusive dealership in the Orient. Moreover, the trading conditions are identical with United States and the United Kingdom. It was a beneficial deal business for Japan which platinum demand had been increasing that time. However, the consumption of platinum imported from the Soviet Union was rigid, as a conclusion, "platinum badge" was made and sold in 1936. To commemorate this agreement, the Soviet Union Government awarded an oil painting which was well worth "100 thousand dollars" just after the end of the war! This oil painting is still kept in good care as an important asset which tells the history of TANAKA PRECIOUS METALS. Becoming the management factory of the army and navy forces and the technologies developed for military industry during the war have become the basis of the industrial technical power of TANAKA PRECIOUS METALS. In 1945, due to the contribution of platinum refining during the war, an award was presented by Defense Minister at that time Shigeru Yoshida (different person from Shigeru Yoshida who became the Prime Minister later). That technology was utilized and contributed to the development of our company was for the production of "crossbar contacts" in around 1955. "Crossbar contact" is a contact to connect data transmission channels in a horizontal direction intersected with the vertical direction, which means trapezoidal precious metal contacts are placed crisscross and contacting to each other. A contact will lose its functions if there is an oxidation, sulfuration and surface roughness when it contacts, it heats up, melts and welds. Therefore, precious metals resisted to oxidation are being used. After the war, MacArthur's Allied Forces headquarters introduced a policy to have a complete telecommunication network. Due to this the work of the contact for telephone and switchboards increased rapidly. From around 1953, the research of the crossbar method which was adopted in the United States that time had advanced, by following to the wave of the economic revitalization of Japan, the demand of crossbar contact rose rapidly. Although we were caught up in the production of crossbar contact, due to the customer requirements, the use of pure solid precious metals has moved to less precious metal contacts resulting in the achievement of cost reduction. With the experiences of that time, our technologies in materials and processing have further grown.